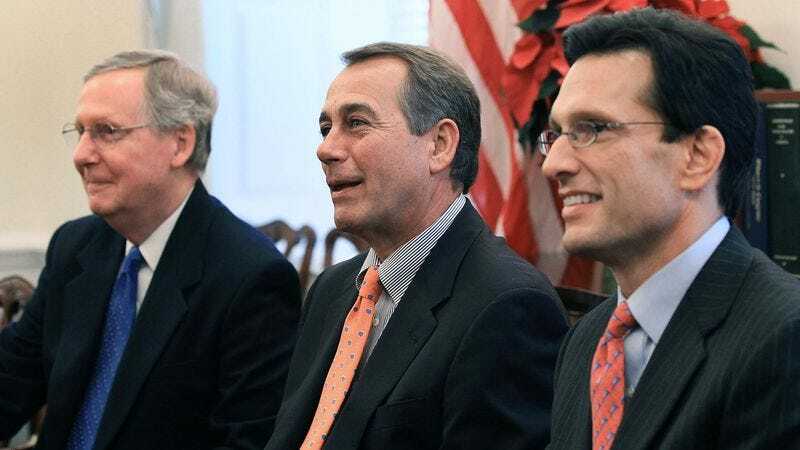 WASHINGTON—Following the president’s reelection Tuesday, top Republicans Mitch McConnell, John Boehner, and Eric Cantor expressed relief, saying the primary purpose of their lives—to stymie, irritate, and confound President Obama at every turn—had not been taken away from them. “Had Barack Obama lost his occupation, then we too would have lost ours,” said Sen. McConnell (R-KY), calling an existence in which he doesn’t wake up every morning and figure out ways to systematically block the president’s agenda an empty one. “Tomorrow, I will go to the Capitol building and immediately say that Republicans are unable to work with the president if he wants to raise taxes on the wealthy. That’s a life worth living. That’s a life where I feel like I’m actually contributing something to society.” Cantor and Boehner said they were thankful not to have ended up like Sen. Lindsey Graham (R-SC), who committed suicide after the first presidential debate, when it appeared as if Mitt Romney might win the election.